I was a reporter covering schools in several counties, so I heard that one a lot. One particular superintendent was fond of reciting it every time I had him on the run – which was often, because questions equaled threat to him. “I’m just trying to do what’s best for the children of this county and I wish everyone would stop criticizing,” he’d say. I like that line. It’s going to come in handy as we get ready to move – we still don’t know exactly where or when. But I do know Dad will amp up the pressure to get rid of my precious possessions that he just doesn’t understand. Chief on his chuck-it list will be anything related to cake decorating. He doesn’t get how I can spend so much time over something that’s going to be eaten, though he has started to come around in recent years, since the guys arrived. It’s “for the children,” after all. So I’m figuring that my only hope for preserving my collection is to convert as much of it as possible to “for the children” status. The guys love their cakes – making and eating, after all. That means the gear really is theirs – not mine. And that’s why I dragged out a cake projector – yes, I have a special projector for transferring images to cakes – this week for Boots’ birthday cake. Judging by the clip art that was in the box when I unpacked said projector, I’d say I hadn’t used it since 2002. There’s a huge blooper in the cake, by the way, that I missed in my wee-hours rush to finish. Boots picked up on it the second he saw it the next morning. I’ll reveal it tomorrow unless someone figures it out today. I’m also willing to sacrifice 10 to 15 percent of my dozens of cake pans – mainly the cheapies bought before I realized the joys of professional-grade bake ware. A computer printer reserved for food-safe ink and used for printing pictures for cakes also can go. It’s so old I doubt I could find a driver for XP, let alone Vista. Someday, though, I’m sure I’ll have to buy another. I wish Mr. Superintendent could hear me now. He’d be so proud. Fantastic cake! You should go into business and makes lots of money doing that! Where are the railroad tracks? Is that what Boots noticed? I only noticed because I went searching for a blooper. Other than that the cake looks perfect to me! Very nice! Keeping y’all close in thought and in prayer as you figure out the moving thing! Boots did comment on the lack of track, but that wasn’t the big problem. I realized about midnight, when I got ready to decorate the cake that I didn’t have a picture on my computer that I could do easily in icing. “Easy” was a key point at midnight. 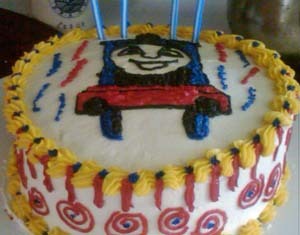 So I googled Thomas images and grabbed the first simple one I could find. I thought there something weird about it as I looked at a toy Thomas to try to get the detailing down, but it didn’t register. Oops. Wrong train picture. I guess I’ll have to have Boots “proof read” his own cake next year! Thanks for the good thoughts. Dad is flying out today, though we’re still not sure exactly when he’ll get here. It’s complicated – no surprise there, huh?